Details for the 2nd Annual Women in Automotive conference have just been announced. The 2-day conference will take place at the Omni Orlando Resort at Champions Gate in Orlando, Florida on June 26-28, 2016. The focus of the 2016 Women in Automotive Conference will be educating and empowering the automotive community on thought leadership and trends that positively impact employment and sales growth within the female market. “More than 300 professionals from across the country attended the inaugural Women in Automotive Conference in 2015, we expect to double attendance at our 2016 event,” stated Christy Roman, Founder of Women in Automotive. Sponsors and attendees from the inaugural event in 2015 included AutoNation, Asbury Automotive Group, Hendrick Automotive, BMW Careers, General Motors, Cars.com, Cox Automotive, CDK Global and Digital Airstrike. Industry Associations included the Florida Automobile Dealers Association and the Women’s Automotive Association International. This year’s expanded event will include seminars, workshops and keynote speakers all designed to assist in communicating to and capitalizing on the benefits of women both as employees and automotive consumers. The goal – to move the automotive industry forward relating to one of most influential segments of the market: Women. 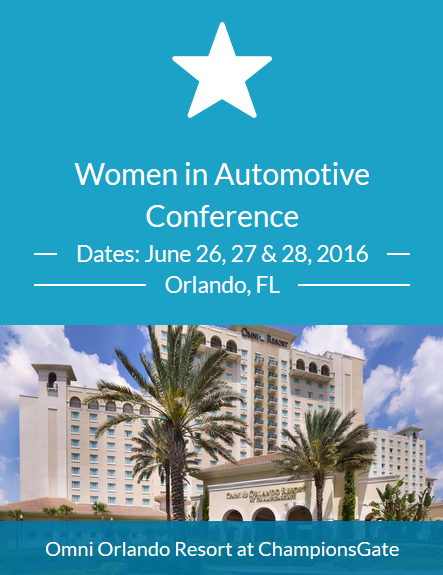 Both male and female automotive professionals are encouraged to attend.